Help maintain strong and healthy - yet flexible - nails with Nailtiques Nail Protein Formula 1. This carefully balanced formula will continually work to bond the nail layers together while preventing the nail from becoming too hard. Created to treat different nail conditions, Nailtiques Nail Protein Formula 1, a salon-tested formulation, offers special combinations of ingredients, including hydrolysed keratin and protein in combination with gelatin and calcium to build a healthy nail foundation. The protein formula bonds the nail layers together building a strong nail foundation resistant to peeling, chipping and splitting. Nailtiques Nail Protein Formula 1 is recommended for nails that are naturally healthy or have been treated with Formula 2 or Formula 2 Plus and have overcome previous problems. To maintain healthy and flexible nails, apply Formula 1 three times per week. Formula 1 may be worn alone or as a base coat and topcoat with colour polish. I have used every nail product under the sun and Nailtiques Formula1 is the only product to rescue my ailing nails. First introduced to it years ago by a friend after I had an illness, my once beautiful nails just peeled off. I have used Formula 2 but always go back to Formula1. This product is fantastic I have now progressed onto NAILTIQUES FORMULA 1..from Formula 2 My finger nails are SUPERB ..healthy, strong and for the first time in Many Many years, I am proud of them and how they look. I have tried lots of different nail strengtheners ..some worked for a while ( or seemed to) some seemed to make things worse... by chance, I came across this amazing product.. IT WORKS!! IT REAALY WORKS!! One tip ... look on uTube.. it features in many videos. I noticed a change in my nails within the first week, although it's a bit more pricey than I usually pay its well worth the money, extremely pleased with my purchase, delivery was very quick as well. i have been using this product for a week and have seen a vast improvement in my nails, i used to have calgel overlays but stopped having them done a year ago.. and my nails were a mess..i will continue with the formula 1 as i am impressed with the results so far. I have had soft nails for years, they were so bad that when I washed my hair the hair acted like a cheese wire and would cut into the nails, sometimes actually slicing them off. I have been using formula 2 and it has totally changed my nails. They are strong, long and with no splitting at the ends. I have just had my first french polish and I am trilled with the results. Thank you! I have purchased Nailtiques products before and they are excellent for nails. I would recommend this Nailtiques Nail Protein Formula 1 for weak and splitting nails. Amazing you could not find anything better if you tried. 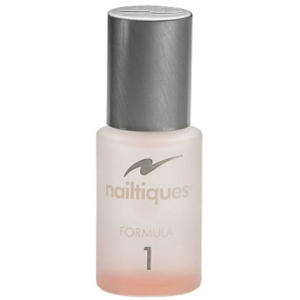 This Nailtiques Nail Protein Formula 1 is amazing, you could not find anything better if you tried.